Comic-Con 2012 brought us the first look at many things for this December’s release of The Hobbit: An Unexpected Journey. This was the first time fans have gotten a chance to see the tip of the ice berg of products we will get to buy starting in October. Companies like Weta even got to have exclusives to the show for the movie. 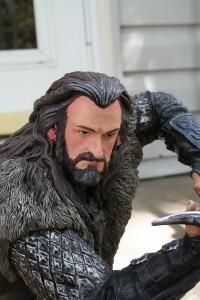 The exclusive from Weta was the first statue in the 1:6th range of statues from The Hobbit: An Unexpected Journey. The character chosen to lead off the line up is the leader of the Dwarven Party Thorin Oakenshield himself. Thorin was one of the many dwarves of the Lonely Mountain driven into exile by the dragon Smaug in the year 2770 of the Third Age. During, Battle of Azanulbizar having had his shield shattered Thorin grabbed a large Oak branch this giving him the name Thorin Oakenshield. Upon a chance meeting in Bree with Gandalf The Grey and his urging Thorin with his company would go to visit the hobbit Bilbo Baggins. From Bag End they would begin the quest to reclaim the Lonely Mountain. The mountain would be reclaimed but not all of it would be a happy ending for the traveling party. The graphics on the box are different than anything Weta has done recently with their The Lord of the Rings products. It however is a throw back to how the boxes looked like back in the day when The Return of the King statues were coming out. The front of the box has great design work going down the side and it even looks very Dwarvish. Also on the front you have a great shot of Thorin, graphic work for the title of the movie, Weta logo, and an exclusive logo for the Con item. The sides present a couple of different looks with one showing great shots of Thorin from different angles while the other side show some of the products that will be coming out for The Hobbit: An Unexpected Journey (check out Gandalf and then the pictures we posted from Comic-Con). 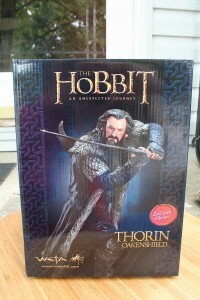 The back of the box contains a great story on Thorin as well as information regarding details about the exclusive nature of this statue. Inside the Styrofoam did its job to keep this safe and a little different in how the base is stored. The sculpting on Thorin is really good and shows in a larger scale the talent that Weta has in their house with Scott Spencer bringing Thorin to life. The facial sculpt is really quiet good and really captures what we’ve seen of Thorin allowing the fans to have a mini Richard Armitage in their collection. As usual Weta did not miss out on the many other details on a collectible you buy from them. You have so much detail going on in the bits of armor looking like armor, fur details on his coat and around his boots, and especially the elvish design of Orcrist with its sword sheath. The exclusive nature of this statue is the oak shield, which looks great and does add to the overall statue. My favorite part of the sculpting is on the base with Thror/Thorin’s map. 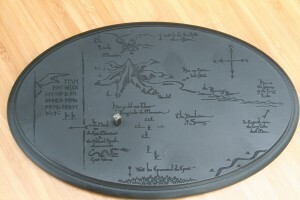 This was quiet pleasing to me and many collectors as its exactly how the statues for The Lord of the Rings were done with the Map of Middle-Earth on those pieces. The paintwork on Thorin is strong. You have great clean lines and the details are brought out even more so by the wonderful paint job. The skin tones are great and look natural not going too light or too dark for what we’ve seen in the trailers. The most impressive paintwork though is on the outfit and Orcrist as all of those look like something you’d see in the real world. The fur looks like real fur with the detail and paint giving it that needed touch to really look good. The work on Orcrist and its sheath are quiet exceptional to this collector. Orcrist looks like its really made out of metal and the elvish details are not lost but increased with the paint work with the sheath looking equally as good with its wooden detailing being highlighted nicely. 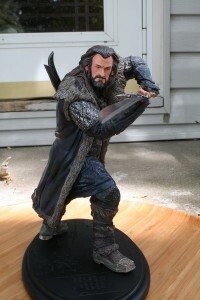 Thorin retailed for $250 at Comic-Con and will be the same price at Ring-Con/the Weta Cave. If you can get him for retail do so because as with any Con Exclusive and first of a line he’s already going for above retail on the secondary market. Being the first of the line, a Con Exclusive, and from something I’ve been waiting years to see I had to get this statue. This statue is a great start to what should be an amazing line of collectibles for this story and with the other statues that Weta had at Comic-Con I feel confident saying this. If you are not able to get the version with the shield do not worry as one without it will be up for sale in October and you will be no worse for having that version of this amazing statue. The edition size of the Thorin is 700 world wide with a retail price of $250. *Note when you look at the pics make sure you have sword facing the other direction as I have it going the wrong way in the pictures.